Dorothy A. Brittner (Colucci), aged 74, of Grand Rapids, was called to her heavenly home on Thursday, February 7, 2019. Dorothy loved cooking with her family and baking with her granddaughters. She made many friends through her many years working in property management. Her parents, Albert and Lucille Colucci; preceded her in death. She will be lovingly remembered by her sons, James (Karen) Brittner, Mike (Christa) Brittner; granddaughters, Summer, Danielle, Lexi; brothers and sister, Albert (Phyllis) Colucci, Patricia (Paul) Reynolds, William (Jeanette) Colucci; and many nieces and nephews. The family will greet visitors on Sunday, February 17, 2018 from 3 to 4 pm at the Stroo Funeral Home; where a service to celebrate the life of Dorothy will begin at 4:00 pm with Pastor Mike Conklin officiating. 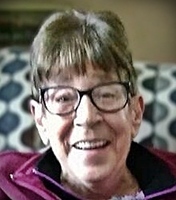 Contributions in memory of Dorothy may be made to The Humane Society of West Michigan or to Degage Ministries.